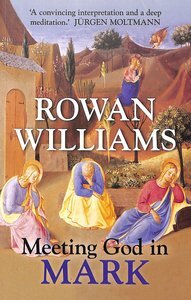 A fresh look at the message and meaning of Mark's Gospel by one of the world's greatest living theologians Based on his popular Holy Week talks, given to a public audience in Canterbury Cathedral Highly recommended reading during Lectionary Year B Focus on the Passion narrative makes this an ideal book to read or give during Easter (in 2015 and beyond) Rowan Williams explores the essential meaning and purpose of St Mark's Gospel for complete beginners - as well as for those who've read the Gospel many times before and want to see it in a fresh light. Written at a highly accessible level and packed with illuminating spiritual insights, this book would make a perfect gift for anyone thinking about confirmation, while also appealing to people who may simply be curious about Jesus and the Gospels and want to learn more about his significance. About "Meeting God in Mark"